At Amiri Baraka’s funeral in 2014, Saul Williams recited a poem imploring the iconic poet, author and social critic to “get out of the coffin” and continue his important work. Sadly, Baraka was beyond hearing the younger poet’s words, but they did reach the ears of one of his closest collaborators: saxophonist David Murray. Williams sent several of his works to Murray, mostly pieces that were soon to be published in his politically scathing 2015 collection, US(a. ), which powerfully confronts issues of race, class, gender, economics and culture in modern-day America. The saxophonist responded to the poet’s words with his trademark vigor, resulting in their new album, Blues for Memo, due out February 2 (digitally). Recorded in Istanbul at the end of a three-week European tour by request of the legendary Turkish producer Ahmet Uluğ, the album features a stellar band – pianist Orrin Evans, bassist Jaribu Shahid, and drummer Nasheet Waits – performing road-tested versions of these newly-penned compositions. Trombonist Craig Harris, keyboardist Jason Moran, guitarist (and Murray’s son) Mingus Murray, kanun player Aytac Dogan, and vocalist Pervis Evans offer striking contributions as well. Blues for Memo was commissioned by Ahmet Ulug, of Pozitif music in Istanbul to commemorate his late brother Mehmet Uluğ – affectionately known as “Memo” – who co-founded the music promotion company Pozitif (with a third partner, Cem Yegul), and opened the well-known Istanbul club Babylon. Pozitif opened the doors to experimental jazz in Turkey, and have presented such artists as David Murray, Butch Morris, Sun Ra and Pharoah Sanders. The album is a labor of love from Murray to the Ulug brothers in response to their many years of friendship and support. Saul Williams knew Memo from his shows in Babylon in the late ’90s with saxophonist Ilhan Ersahin’s Wax Poetics project. Two decades later, Williams could count a wealth of experiences stemming from his widely acclaimed work: a half-dozen books, appearances in films including Slam (1998), the lead role in the Tupac Shakur-based Broadway musical Holler If Ya Hear Me, and several albums fusing his poetry with hip hop, rock and electronic music. 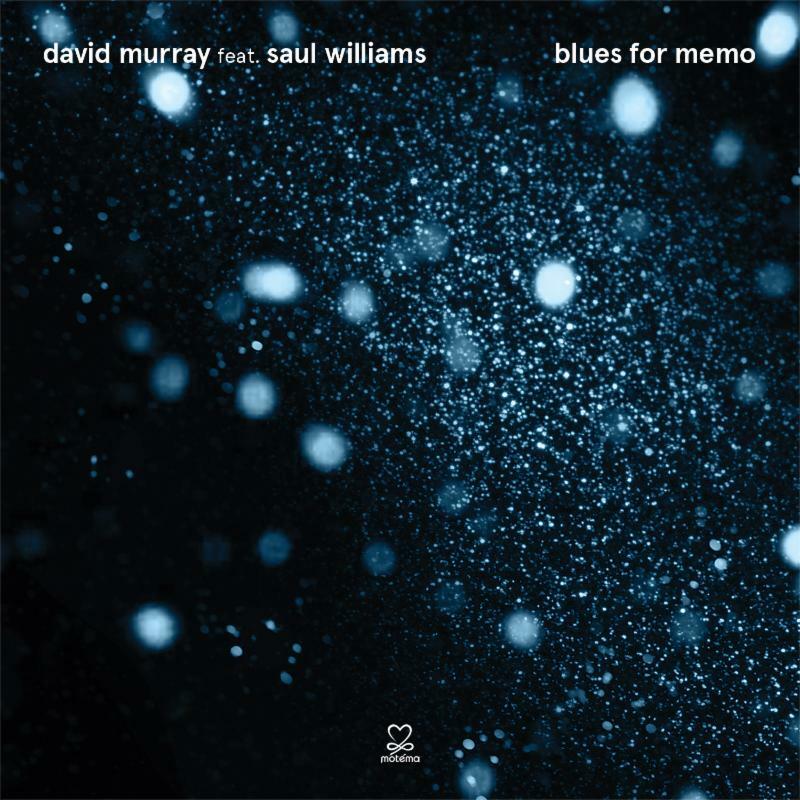 So with an established reputation, years of distance, and a deep respect for Murray’s work, he undertook his first substantial jazz collaboration – and was surprised by what he found. The band also takes a few pieces without Williams’ words. The title track pays homage to Memo with a blend of blues and classical Turkish music with the addition of Aytac Dogan on the kanun, a zither-like stringed instrument from the Middle East. Murray’s “Positive Messages” offers an uplifting yet forceful message, with a laid-back groove fueled by Moran on Rhodes; Sun Ra’s “Enlightenment” tips its hat to the Uluğ brothers’ love of the cosmic bandleader and the influence of his teachings on Murray’s formative years. At a challenging time, Williams’ interpretation is understandably confrontational and incisive. Commissioned by Simon & Schuster upon Williams’ return from a four-year sojourn in Paris, US(a.) was intended to be a celebration of being an African-American living in Obama’s America, but the string of police shootings that led to the Black Lives Matter movement and the rise of Donald Trump led to a much darker tone. A piece like “Red Summer” is directly inspired by the 2015 mass shooting in a Charleston church. “Citizens (The River Runs Red)” takes an excerpt from “Said the Shotgun to the Head,” urging a shift from a patriarchal society to a female perspective. “Cycles and Seasons” draws from Williams’ poem “Coltan as Cotton,” which parallels the mining of coltan – a precious mineral found in smartphones and other technology – with more traditional forms of mining. One Response to "NEW JAZZ RELEASE: David Murray feat. Saul Williams – “Blues For Memo” | Coming Digitally Feb. 2nd – Physically Feb. 16th, 2018"
where can I order the Vinyl from?